40 million pounds of the country’s lobster is caught off of Maine’s coast, so this Brooks Brothers lobster sweater is necessary Maine attire. The first umbrella factory in the U.S. was built in Maryland. An umbrella is an awesome gift or stocking stuffer because you almost always need one in your car, purse and house! I’m a fan of the bubble umbrella - they keep you dry and you can see through the clear part! Another first for Maryland is the first dental school. Prep your little ones for a visit from the Tooth Fairy with an adorable pillow. Babe Ruth was born in Maryland. One of the Bambino’s jerseys is a great gift for a baseball fan! 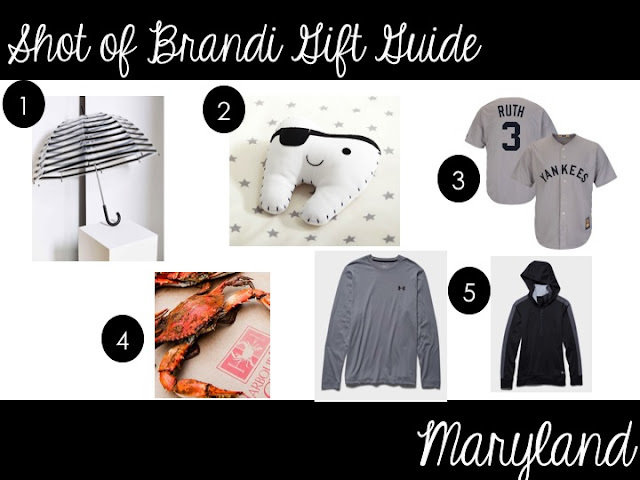 Oh and I recognize that a Yankees jersey looks a little odd on a Maryland gift guide! Maryland’s most famous food is the crab. 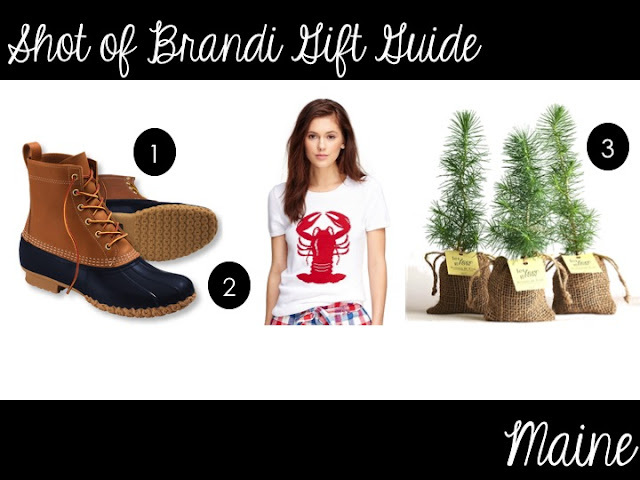 And if you’ve been following along with this gift guide you probably know that I’m going to say that you can ship crabs. The Under Armour brand was created by a former Maryland football player in 1995. There are endless amounts of gifts that you can find from Under Armour like this men’s t-shirt or women’s zip up (with bonus hood). Boston fans are really passionate about their sports teams. From the Patriots to the Celtics to the Red Sox - all of the pro sports teams in Massachusetts are super good. 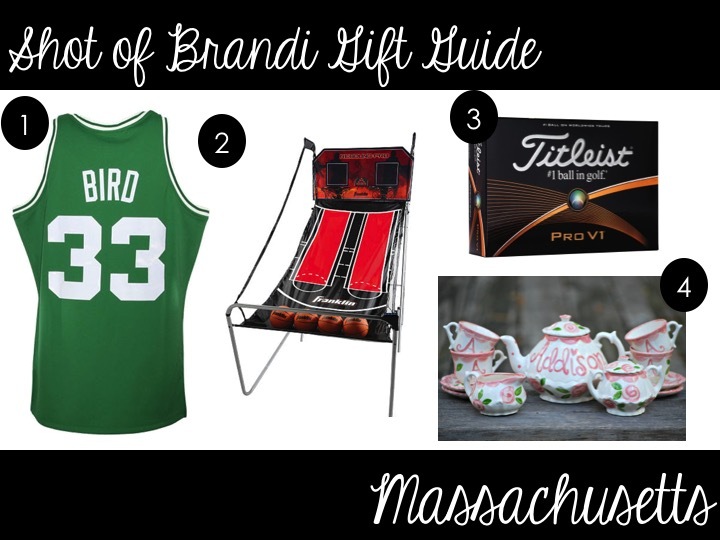 Since I kinda have to recommend one piece of sports apparel from the state, I’m going to go with the Larry Bird Celtics jersey. Sticking with the sports theme, the game of basketball was invented in Springfield, Mass. by Dr. James Naismith. If you have the space in your house, this indoor pop-a-shot is kinda awesome! Oh and the basketball hall of fame is in Springfield. A good gift for the avid golfer is a pack of golf balls. Acushnet is actually the hometown of one of the most famous golf balls - Titleist. Growing up I always remember learning about the Boston Tea Party in history class. Since tea isn’t really grown in Massachusetts, this historic event inspired me to suggest a tea set as a gift! How cute is this personalized set from Etsy! ?